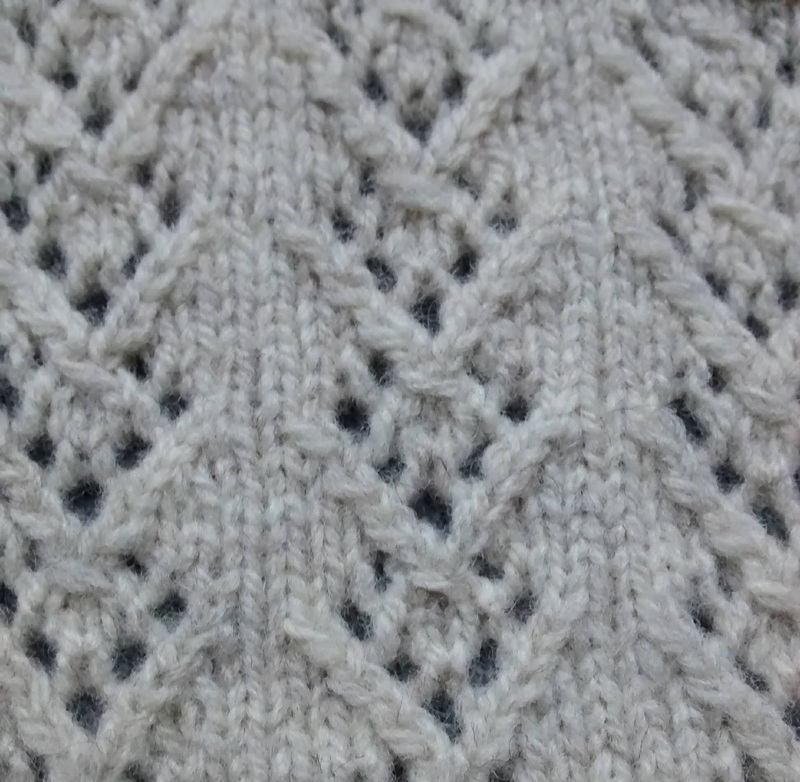 Its been a frantically busy time since I last wrote introducing this lovely Norfolk Horn yarn. June is always horrendously busy. This year more so than normal. In between getting out out and about giving a hand with shearing and sorting fleeces for this years clip I’ve also been carrying out more research into the Norfolks history – more on this exciting project as the next few months go by. All this squeezed in between the usual events, craft fairs and festivals that seem to run back to back from May till now. Introducing my lovely yarn to its public in addition to my usual hand dyed fibres and hand spun yarns has been great. I’ve met so many interesting people and gained new contacts. The network grows. Its been overwhelming at times. Family life has also taken a busy turn in the past month or so. With children returning home as adults (a memorable day trip to Lockerbie for lunch and bringing home a kayak). At the same time Sean’s mum is transitioning to live with her children. A busy time indeed. But now things have slacked off and I have had time to play in the workshop with this lovely Norfolk Horn yarn. Putting it through its paces and seeing what it can do well. I hope these swatches will give you an idea of the sorts of textures and patterns that it will work well with. 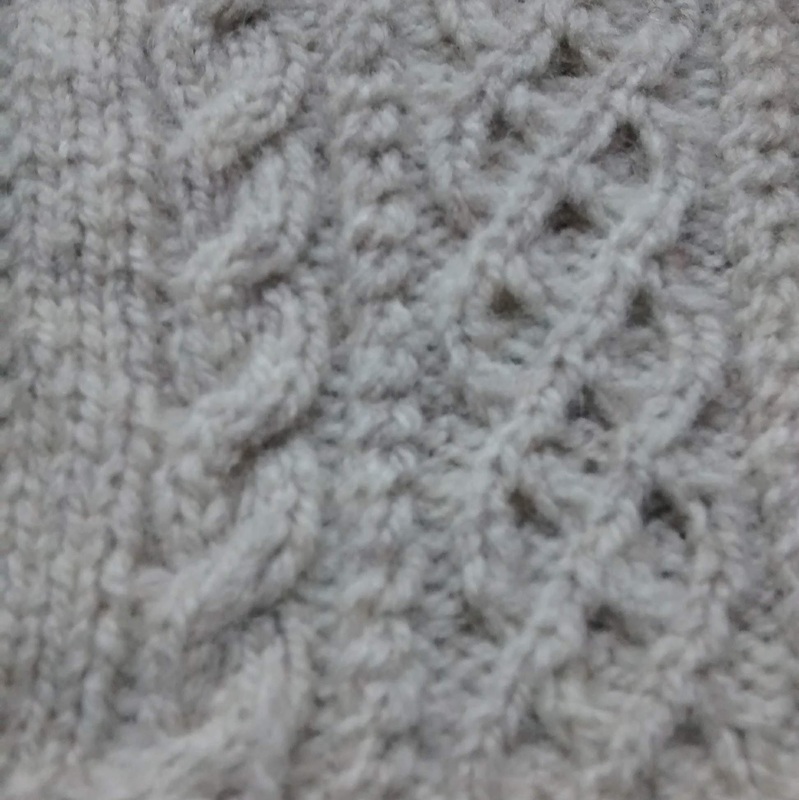 I’ve tried it out in plain, eyelet and cables. Its giving really good stitch definition and a nice handle. Its the best of sheepy yarn: bouncy, soft and not too tickly. 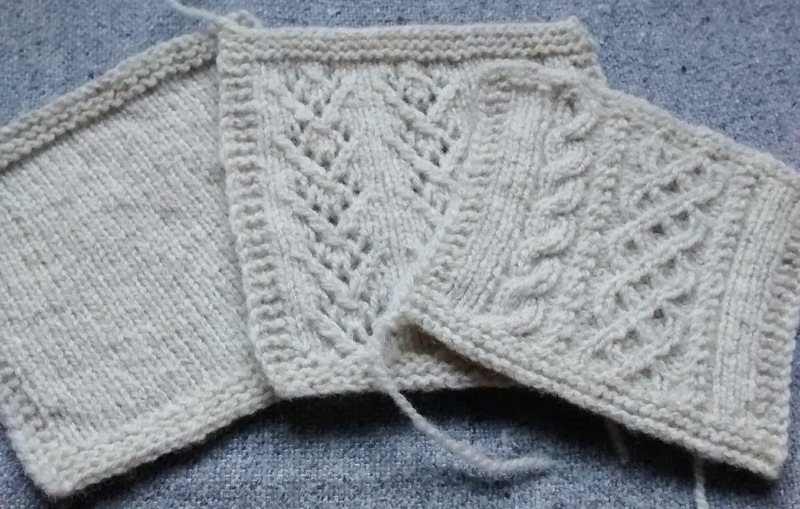 The following swatches were all knitted on 3.5mm needles. Its has a delicate pearly shimmer to it. And I’m really liking the oatmeally and the peppering of dark dusty flecks of colour in it. I am experimenting with dyeing it. Its going to take some time as I really don’t want to loose that special shimmering colouration that is so Norfolkish. I’ve also been working on some one skein wonder patterns, these I will publish on Ravelry as I finish them to the point where I am happy with them. I am learning to accept that these things can not be rushed. If you wish to get you hands on some don’t wait too long, its going fast. Full details on the yarn and how to buy it can be found here.